And that’s not as much of an exaggeration as you might imagine. Even at such a young age, Bond had already developed a special attachment to the sea. That’s when he enrolled in Laguna’s Junior Lifeguard Program. Fast forward to 2018, and he’s now Captain of Marine Safety and has been employed by the City for 23 years. Although Bond wasn’t born in Laguna, he grew up here, and the ocean has always played a major role in his life, so the journey from Junior Lifeguard to Captain of Marine Safety isn’t unexpected, but it took a while. Bond participated in the Junior Lifeguard Program every year (from 8) until he was 15. I ask if there’s anyone from those days still around? He was hired as a full-time lifeguard in 1995, and in June of 2006, he became an officer with Marine Safety. In November of 2017, he was appointed Captain of Marine Safety. However, while growing up, he couldn’t spend all of his time in the water. Bond attended Top of the World Elementary, Thurston Middle School, and Laguna Beach High School. Then he continued on at Orange Coast College and Long Beach State, where he earned a degree in Film and Electronic Medium Management, which turned into being a production assistant on films. This work translated into long days in Los Angeles, but he was still deeply entrenched in Laguna. With his new position as Captain of Marine Safety, comes a tremendous amount of responsibility – public service and education, overseeing lifeguards, interaction with City staff, contact with community members and visitors – there are many plates to keep in the air, and his training as a production manager serves him well. Because isn’t that exactly what production managers do, make sure everything is running correctly, and I mean everything? And the challenges are increasing. 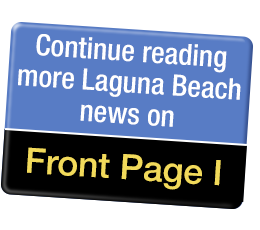 “The number of beachgoers is up, there has been a significant increase. We had 6,000,000 visitors last year,” Bond says. That’s a substantial number of people to keep an eye on. Additionally, they have rigorous criteria that must be met. Current lifeguards must requalify every year in order to return. They must be able to swim 1,000 meters in under 20 minutes and have recertification in CPR and first aid. In addition to his operational duties, Bond also must attend a fair amount of administrative and City Council meetings, and he works closely with the Fire Department and the Police Department. It’s clear Bond loves his job. What is his biggest challenge? However, dealing with the public must be frustrating at times to lifeguards. Bond spends a considerable amount of time educating the public, and as result, he’s been to all the schools in town. He lectures on beach safety, and the kids are able to come to the lifeguard station as well for more interaction. Other things have come full circle as well. Does Bond still surf? The answer is yes, and now he’s sharing his love for the ocean with his girls. Given the number of people flocking to our beaches, ensuring their safety appears to be a Herculean task, but if anyone can do it, it’s Captain Bond and his staff of lifeguards. Without a doubt, the journey from Junior Lifeguard to Captain of Marine Safety took some time, but it appears as if Bond was destined for this position from his very first swim in Laguna waters.